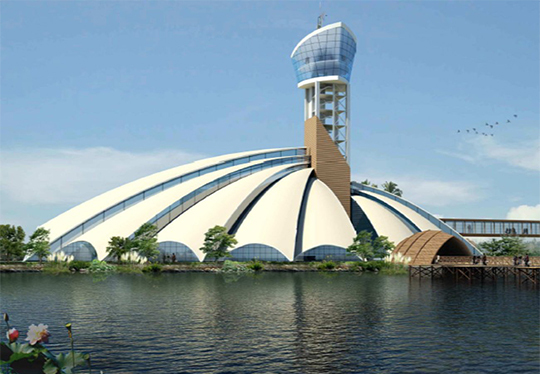 The project shall be viewed as a regional tourism development plan in the beginning phase where all sub regional centers of attraction and their inter connectivities shall be worked out in a hierarchical manner to prove maximum efficiency for tourism sector development without compromising environmental policy. The resources shall be worked on a district level map with the type and hierarchy of inter connectivites. Each sub zones shall be detailed out with micro level aspects of destination like spread of area, existing infrastructures and their locations, accessibility road with and road type nature of area and other characteristics in a map. The master plan shall focus on to the regional as well as micro level issues of the destinations. Each destination shall be taken independently to identify the issues problems, gaps and propose development projects. The detailing shall be done in top architectural standards and estimating prevalent to latest schedules. Financial planning including scope for investors and the kind of outcome shall also be specified. PROJECT PRINCIPLES: The plan focuses on an integrated and sustainable development of backwater &allied tourism potentials in Alappuzha district and to elevate the sector as an instrument promoting for overall socio-economic development. The tourism potentials/ resources in the region shall be carefully identified through effective local participation of the local residents and stakeholders and shall be categorized in the view of developing established tourism circuits for effective dispersal of its economic potentials all over the region.